Dr. Motta writes: "...the first known X-ray source...Sco X-1...is a binary where a neutron star accretes gas from its Sun-like companion. A large number of radio interferometers, optical telescopes, and X-ray satellites will observe this source almost continuously for 3 full days, with the aim to unveil the mechanism that underlines the launch of relativistic jets from the neutron star hosted in the binary system. "The emission from this binary system is highly variable at all wavelengths and continuous coverage is key to probe in detail the physics at play in this system. In particular, fast variability in optical is partly related to the variability produced in an accretion disk, transmitted and propagated through the jet that emits at wavelengths from optical to radio. 3) obtaining at least 1 hour of continuous (60 sec exposure or more frequent) light curves. 4) We also request that the observers send photometry for the V=11.6 mag star [2MASS J16194990-1537248] 97" northwest of Sco X-1 for calibration purposes. as during these time periods we will not have space-based V-photometry from ESA's INTEGRAL optical monitoring camera." The range of V818 Sco is magnitude V = 11.8-13.4 (B = 11.1-14.1). Charts with comparison star sequences for V818 Sco and 2MASS J16194990-1537248 may be created using the AAVSO Variable Star Plotter (VSP). Both stars appear on the same chart. An image of the AAVSO 'e' scale chart with both stars marked may be seen here. 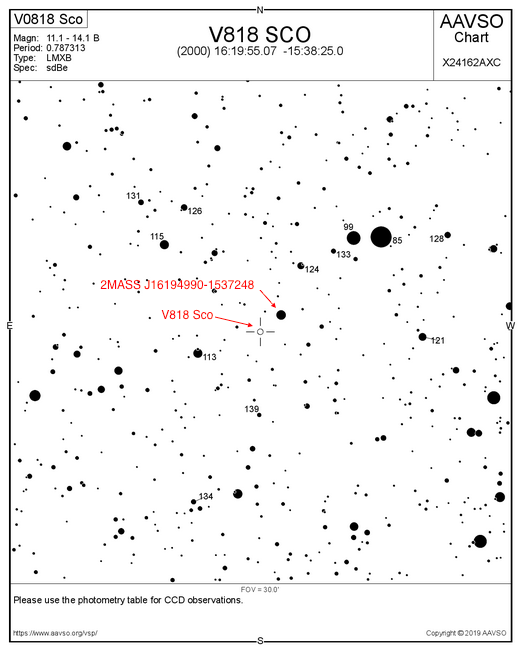 Please submit observations to the AAVSO International Database using the name V818 SCO and 2MASS J16194990-1537248. The 2MASS star is being added to VSX. If it is not available when you try to submit observations of it, please try again later.